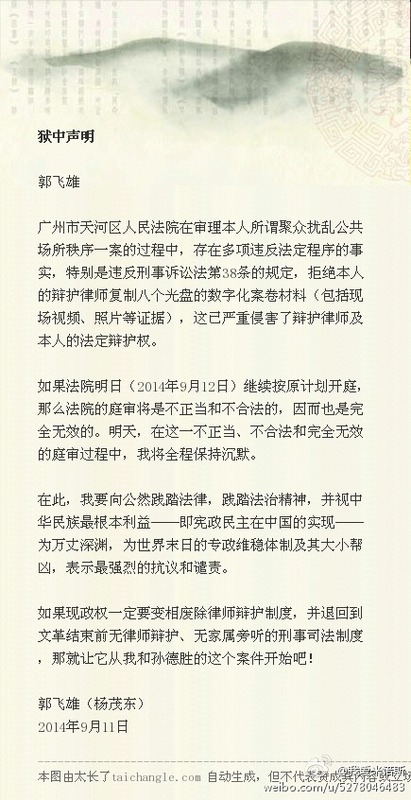 In a statement one day before his trial, rights defense activist Guo Feixiong (aka Yang Maodong) alleges serious procedural violations by the prosecution, in particular, in its denial of his defense lawyers’ right to review case materials on eight CDs that include videos and photos. Such violations, he says, seriously infringed his and his lawyers’ right to defense. He argues that, under these circumstances, his trial tomorrow will be unlawful and invalid, and he will keep silent during the proceeding.